In order to get proper dental care, we need someone like Dr. Peter Rumack who is a Flushing Dentist with the necessary experience and expertise to deal with dental health issues. 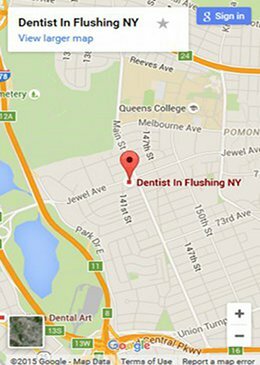 Dr. Peter Rumack is a popular dentist in Flushing, NY mainly because of his excellent track record. He makes the trip to the dentist less anxious. Providing services such as cosmetic, preventive, and general dentistry to all members of the family. Dr. Peter Rumack's dentist office is a one-stop shop for all your dental needs. Our office location is near the corner of Jewel Avenue and Main Street. Strategically located it makes it possible for patients to have easier access to whoever is looking for general dental care or emergency dental procedures. Our office is designed to replicate a home décor so that our patients can be comfortable whenever they visit. Patients, whether kids or adults, all need a relaxing environment and we make sure that all patients enjoy that relaxing comfort while at our dental facility. We have core values that guide us when providing our services. We strive to create a good relationship with our patients. Not only do we provide treatment, but we also provide patients with preventive care services in order to maintain proper dental hygiene. Our philosophy is to help patients attain their personal goals of having good dental health. Dr. Peter Rumack is a graduate from Columbia University College of Dental Medicine, which is one of the best dental schools in the country. By combining his skills, knowledge and expertise with modern technology, Dr. Peter Rumack has built a reputation as a leading dentist in Flushing, NY. His unique ability to handle every dental procedure puts him squarely at the center of the industry. He is also available in the office to attend to patients whenever the need arises, something that makes him accessible to everyone who needs dental care, from regular check-ups to dental implants. Dr. Peter Rumack is a member of several dentistry groups that continually review dental care issues. These groups include American Academy of Implant Dentistry (AAID), the ADA, and the New York State Dental Society. These groups help Dr. Rumack learn about emerging dental problems and their treatment. His continuous learning and engagement with reputable dental networks has made him a specialist in different fields when in comes to dental care. Dr. Rumack works to make a patient smile once again with confidence. He has a qualified team who are compassionate and friendly and who can answer questions right away. Dr. Rumack is a at the top of his game as a Flushing dentist who makes the whole process of treatment less stressful, even for those people who fear visiting the dentist.